Sew, crochet or knit a pair (or several!) 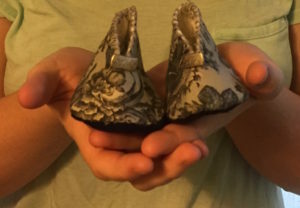 of baby booties in a color combination of black, white, and/or gray. Make each pair unique. Treat each one as a tiny elegy for a too-brief life. READ THE DONATION FORM BEFORE YOU SEND YOUR BABY BOOTIES. It has instructions on how to present the baby shoes. Please mail all baby booties by Mothers Day, May 12, 2019 to Mary Vaneecke at 2000 S. Hermosa, Tucson, AZ 85713. Ask your friends to make a pair of booties. Having a birthday? Ask your friends to make a pair in your honor. Booties by Geraldine Murano, Carol Segal, and Mary Vaneecke. HELP! I need 23,000 pairs of baby booties by Mothers Day, 2019! Please share this information far and wide, and do it often, everywhere you go, in person and online. SHARE this graphic online. Right click on it, save it to your computer and upload it to your Facebook, Pinterest, Instagram, and Twitter pages. Facebook-your page and your quilt/yarn/fabric shop page. Follow TheMourningProject.com on Facebook, and Mary Vaneecke on Pinterest, and Twitter. Invite me to write a guest blog or join your podcast. Invite me to talk to your group. Get your TheMourningProject.com swag at Zazzle. Are you tech-savvy? Could you assist with updating the website? This can be done from anywhere in the world, and in your jammies! Contact mary@maryvaneecke.com if you can help. Do you know a location where we can exhibit TheMourningProject.com? Contact me at mary@maryvaneecke.com. Can you help with installing TheMourningProject.com exhibition at a location near you? Contact me at mary@maryvaneecke.com. Make a financial donation to TheMourningProject.com. Click here for the GoFundMe page. Can you help with storage for TheMourningProject.com in Tucson, Arizona? Contact me at mary@maryvaneecke.com. Can you help with transporting TheMourningProject.com to exhibition venues? Contact me at mary@maryvaneecke.com. Invite your elected representatives and the press to a baby bootie making party. Click here for sample invites/press releases (TBA). Invite your elected officials and the local press to view an installation (dates/locations/times TBA). Discuss how they can enact laws to address infant mortality. Write and call your local, state, and national representatives about the problem and ask them to support proven solutions to infant mortality. Click here for sample letters.